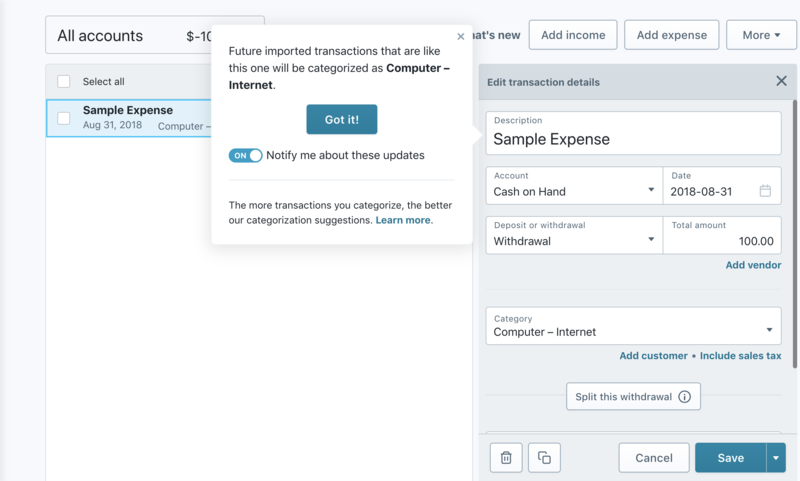 If you have your bank or credit card set up to import transactions to Wave automatically, you may have noticed that some transactions were already categorized when they imported. We know this is a time saving feature, but in talking with customers and using the automatic categorization ourselves, we knew we could do better. We're pleased to announce that we've launched a new and improved system for this. In testing we've found the new system categorizes more transactions, with higher accuracy, than the old system. In talking with customers such as yourself one of the greatest points of frustration we heard time and time again was the fact that the system made the same mistakes repeatedly. No more! The new system will learn from your categorization actions, and remember them for future transactions. We'll even let you know when the system learns from your actions. Have you noticed any changes on your account? Do you find the new categorization to be better than before? If not, where are we falling short? Anything in particular you think we can improve or do better? We'd love to hear what you think, drop us a note below. Note: A small subset of users is currently testing this feature, we're rolling it out to all users over the next month. If you haven't noticed any changes in your account yet don't worry, we'll have them rolled out to you in the next couple weeks. Is there any way to do job costing or to break out costs by specific properties in a property management company, such that you can run P&L's for individual properties and consolidated? Hey @SarahL. 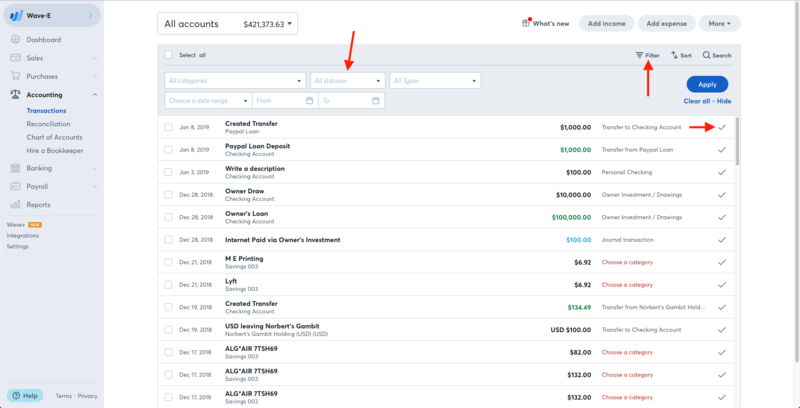 There currently isn't a way to breakdown the P&L report for specific jobs in Wave, unless you have created each property as a separate business/have all of the expenses as well as income for that property correctly categorized on the transactions section. This would essentially be the only workaround that may help with what you are trying to accomplish in Wave. That's what I figured out, too, @JamieD, thank you. I set up separate accts labeled by property/job (Repairs-aaa, Repairs-bbb, Repairs-ccc), will transfer ending balances over to Excel, where they'll auto-populate pre-formatted financial stmts. This works well as long as we keep a relatively low number of properties in each management group (business), otherwise it could get cumbersome. So far, works great! is it possible to do it for old transaction as well? e.g. I want all transactions for the past year containing the word "clickfunnels" to categorize to "software" - is that possible somehow? Hey @Efrat, this would depend on whether or not you've/Wave auto-categorization have categorized certain items into a clickfunnels category or account. If so, you could narrow down your transactions page to this category, and bulk edit these transactions to 'software'. At the moment, Wave doesn't have a search function for transactions, so unfortunately if this is a description you've added to items instead, there wouldn't be a way to sort your page just to them. 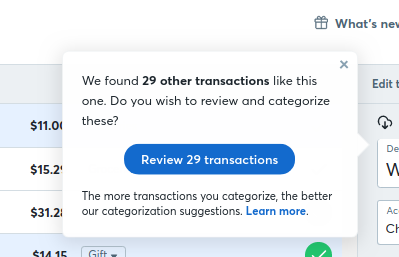 One workaround would be to use control+F and search for clickfunnels that way, and select and edit each transaction on their own, or alternatively check the box to the left of each and bulk re-categorize. What can we do to disable this functionality? 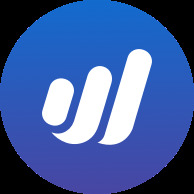 Part of what we've loved about Wave for years is that it forces us to make a thoughtful choice about categorizing our transactions. Also - working on a team - it's ambiguous whether one of us has categorized a transaction or not (unless we mark it as 'reviewed'). I can't seem to find any way to turn off auto-categorization. I also would like to turn it off. It's intuition is way wrong too often on my transactions -- it is doing the bot equivalent of "assuming" on too many transactions, so I am discovering by combing through my transactions by category where the assumptions were made. I don't like this kind of surprise, which ultimately -- if undiscovered -- renders my conclusions about operating costs somewhat suspect -- the expenses can look low in one area and higher in another due to random miscategorization. We are also a real estate business attempting to track revenue & expenses across each property. I am currently doing this by making each property a "customer." Is it possible to have the Auto-Categorization learn the customer and assign that as well? I understand if we would need to manually set that up the first time or check a box or something since this may not be something that everyone would want. Hey @MKCRealEstate, @springdalerocks, and @bizi_paul, there isn't an “off-button” for our auto-categorization feature. However, you are still able to re-categorize any transactions that are incorrectly categorized or are left uncategorized by Wave due to lack of transaction detail. This wouldn’t be too different than if Wave didn’t automatically categorize your transactions, since you would have to manually categorize them yourself anyways. 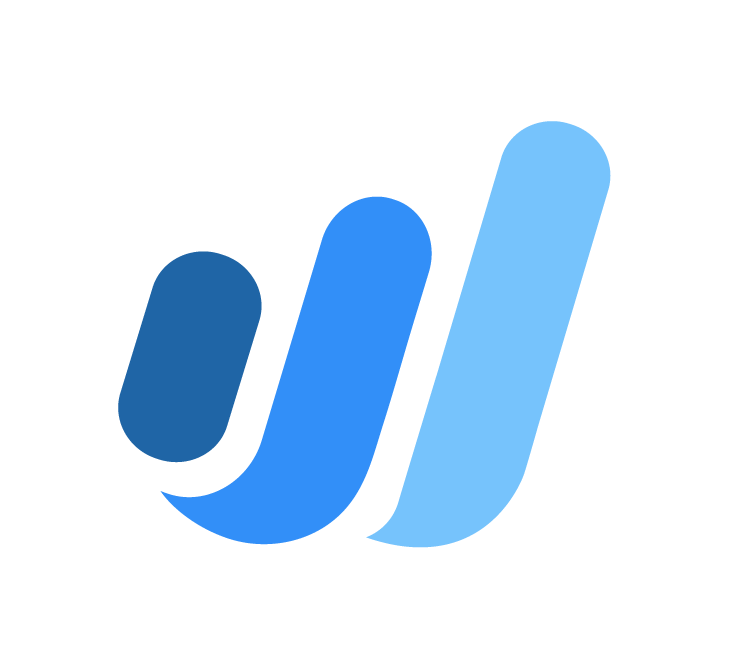 Once you re-categorize something, Wave will learn more about how to correctly categorize this type of transaction moving forward! 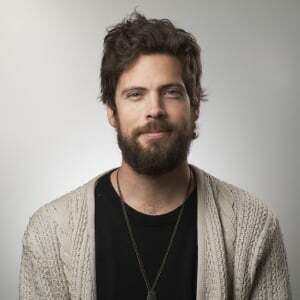 Ryan, I would say that it is VERY different. 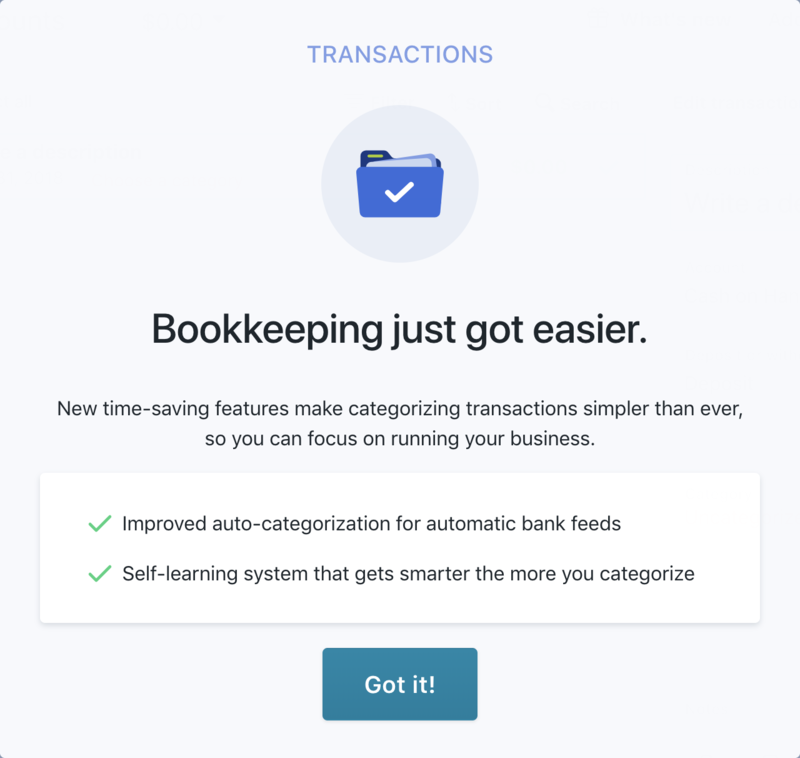 If "uncategorized expense" is periodically reviewed and categorized, that's one-stop shopping for transactions that need attention. If the auto assignments are way wrong, now I have to review in detail the transactions in each category to make sure they are correct, and if I run a report with the miscategorizations, I don't have good business information. So the damage done by incorrect auto categorization goes much farther than manual vs. automatic. Automatically produced wrong information is garbage in, and the reports produced using it is garbage out. The automatic learning process is ready-fire-aim. Back to the drawing board, guys. I have been using quickbooks employed for the past year or so. I just tried Wave because I heard it was free for what I would be using it for. As in this post, the auto categorization does not work for me and since there is no off switch, I can't use it. My purchases vary at the same stores etc, sometimes being a personal expense, sometimes being a business expense. I don't have a business credit card yet or seperate bank accounts, so not having the auto off doesn't work for me. I'll be sticking with quick books for now. @springdalerocks @ShanePikelin you both raise valid concerns and we hear you loud and clear. 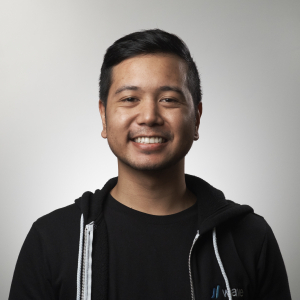 While I don't have a specific ETA available for you, we are looking to give users the ability to turn of auto-categorization on a per-account basis in the future. We really appreciate the feedback you are giving, so thank you so much for this. @springdalerocks @ShanePikelin after much discussion with my team I want to retract my earlier suggestion and let you know that we will continue to improve on the accuracy of our auto-categorization function. This is something that we are dedicated to, because of the value we see in it. As such, we currently don't have any concrete plans in place for the ability to turn this feature off. However, once again, I understand where the both of you are coming from. In the meantime, you should be able to implement a similar workflow to the one you mentioned (one-stop shopping for transactions that require attention) by using our transaction filter. From here, you would be able to filter by transaction status: Reviewed or Not Reviewed. If you mark transactions as Reviewed when categorizing (clicking the arrow to the right of transactions), then you will have told Wave "These transactions are correct; I no longer have to revisit them". You would then be able to carry out your final revisions by using the Not Reviewed filter. When I first started using Wave many years ago, the auto categorize function worked great. I rarely had to categorize anything. Then something changed and now I have to manually categorize almost everything. No biggie I guess. Nothing improved so far in this update. Hi< I don't seem to have this feature yet and I don't see anything about it in Settings. I am in the UK. Do you have a date when it may be fully rolled out? Erik - I love Wave and the features it contains, but this auto-categorization "improvement" is very frustrating. As mentioned previously, the workflow is now very different though I do see there is a new work around. Quite a few of my transactions that I had previously categorized are now requiring me to re-categorize them. Also, a couple of the accounts will not populate when trying to use them. I think you must find a way to allow users to shut this off. The "Reviewed" vs. "Not Reviewed" filter is fine and I understand how that looks like a solution to incorrect automatic categorization. Please consider what happens if a very large batch of transactions appear similar to WAVE, but actually are not. The problem that arises is a nagging dialog box prompting us to examine like transactions at every turn. In my case, there are over 1,000 transactions that have the words "Paid Check" in the description. Guess what? That is just about the only thing they have in common when it comes to categorization. And for WAVE to go through all my like transactions and build the total for the dialog box, it grinds and freezes the screen for nearly 30 seconds every time. So I have all of that wasted time to look forward to. It would be great to have the option, because I do use the intelligent bulk-categorization sometimes, but allow us to say "NO" and "remember my answer for this type of transaction" so it doesn't continually come up. 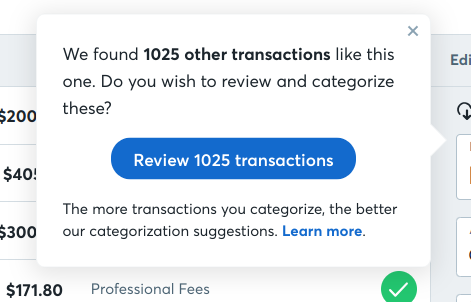 Tried a work-around of choosing to review, selecting every transaction I haven't already categorized and marked "reviewed" and telling it to bulk categorize the rest as "Uncategorized Expense". Doesn't work, because once return to transactions and re-categorize one of those, the dialog box is back prompting to review again...and we wait. 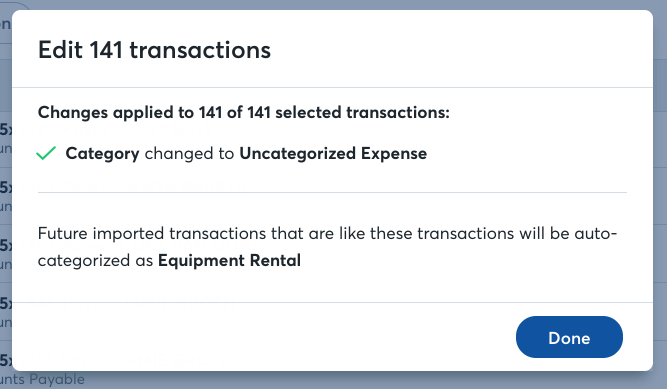 Then, to make matters worse, when I did bulk categorize as "Uncategorized Expense", it told me it would categorize all transactions like this in the future as "Equipment Rental" instead of "Uncategorized Expense." Makes no sense. I will also frequently get the dialog box to review like transactions, choose to review them, and every one of them is already categorized exactly the same and marked "reviewed". Wasted time. Just want to chime in and agree with NSPro44. You've got to find a way to shut off this "feature"! Like NSPro44, I get tons of these popups asking me to categorize 1000 transactions. First of all, I'm not going to go thru 1000 transactions. And even if I did go through them, it doesn't make sense to categorize them because they're all different. Those popups are annoying and a productivity killer, please make them stop! I cannot work out how it has improved. I have over 2000 items from same vendor with the same title on import i have had to do a manual categorisation for them all i change them to Stock Purchase but Wave applies Meals every time to a title that has Online in it?????? When i tried Xero i only had to do a few manually and it picked it up. 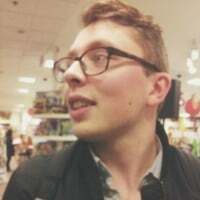 Is there a way to add rules to apply on import? I echo what other users are saying. You need to add an option to disable this feature. It's very obtrusive and annoying to get this pop up box every time I enter a transaction. Perhaps you should reach out to all users or create a poll and see just how many users feel the same way. To make sure the people at Wave know what we do not like because it is extremely annoying. I agree, while auto categorization CAN be a nice feature, I'm not seeing it being ready for primetime here yet. I'm seeing a number of entries mis-categorized on each data import, which means I have to spend time going through them and manually change the categories. That's not helpful at all. Hey everyone. 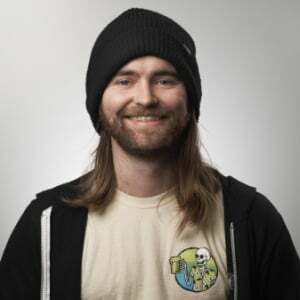 Just letting you know that this thread isn't being ignored and your voices have been heard -- our community team is going to be working on a response to this thread shortly. Stay tuned.